Email marketing service provider and campaign consultancy firm Delivra has unveiled its new Drip Campaign Builder with the company’s latest platform launch. Delivra’s marketing automation Drip Campaign Builder functionality was developed over the last year and a half before launching to users last week. Delivra expects the functionality to be a popular addition, predicting 50 percent of its customer base to be using the functionality in the next six months for emails campaigns dedicated to welcome series, lead nurturing and membership renewals. The Drip Campaign Builder allows users to plot out an entire email series, determining which mailings are sent based on a variety of subscriber actions, inactions or time. 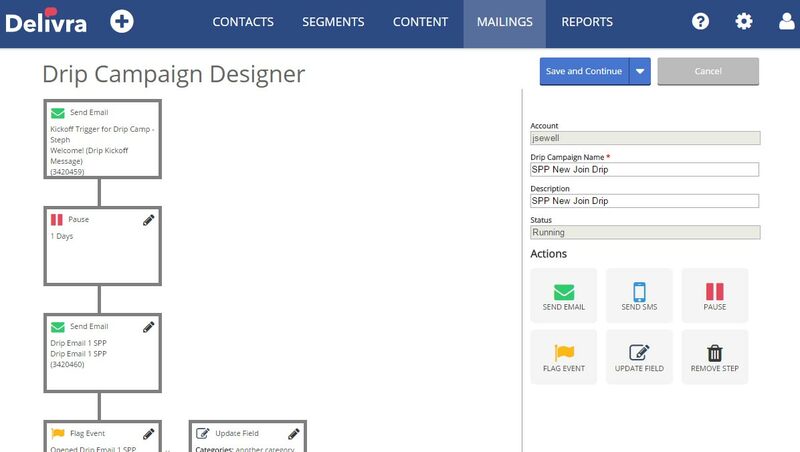 Before the launch of Drip Campaign Builder, Delivra users could create triggered email based on events like opens, visits to a web page, clicks on a link, etc. The ability to flag an event and initiate a campaign tied to an if-then clause was not a possibility until now. A drag and drop interface that makes email building and visualizing easy. Report groups that gather metrics on individual mailings to gauge effectiveness and continue to improve the automated series. Improved targeting for all mailings based on engagement. Ability to send automated SMS messages or a combination of email and SMS if subscribers are signed up for a relevant SMS list. Delivra’s marketing automation tool is designed with non-technical users in mind, a visual builder allows to develop appropriate email actions based on yes/no decisions. According to the vendor, the “or” scenario was deliberately left out of the tool in a trade-off for the ease of use the company’s customers expect. An alternative way to still be able to address many “or” scenarios, is using the capabilities of the Segmentation Wizard. Delivra allows for A/B testing of all emails. Emails can be personalized through mail merge functionality or dynamic content. The latest Delivra platform also includes RSS feed integration, allowing users to pull in headlines, summaries and images from a story to be utilized in mailing content. There are also nine new subscribe form template options. Behind the new offering is Delivra’s cross-functional development team of eight, spanning roles from director of product, quality assurance, development, UX and market research. Technology-wise Delivra uses a dot net server on top of a SQL database. The email marketing service provider told us they launch new platform updates quarterly. Prioritizing intended new features into the categories: innovation, competition, customer requests and technical/internal needs. We are excited to see what is up for the rest of the year. 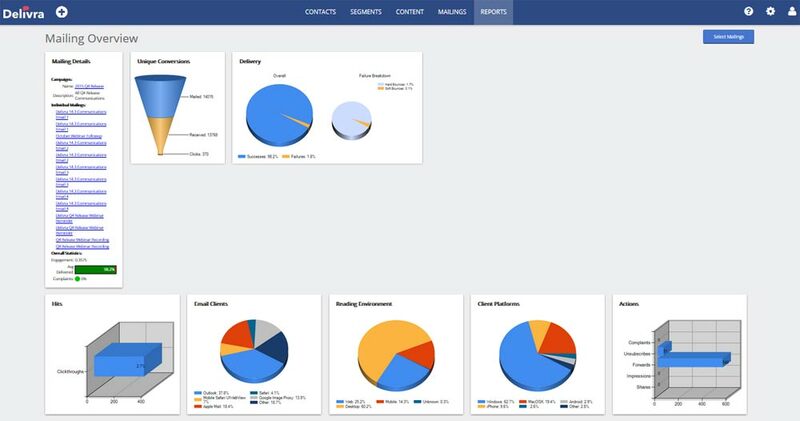 With its previous platform update in Q4 2015 platform, Delivra introduced configurable engagement calculation and enhanced source tracking. Delivra’s editable engagement score is applicable to both mailings and contacts, and ensures email data is providing valuable insights for heightened engagement. By determining what email and user actions are most important to business results (i.e. unique opens, total forwards, etc. ), users can weight engagement score metrics accordingly for customized engagement calculations that enable marketers to develop new segments and messaging strategies over time. Delivra’s Drip Campaign Builder is available to existing customers with Professional and Enterprise software licenses. It is not included with the company’s Standard license.